Part of what draws me to beachwear is how multifunctional the pieces can be. In fact, some companies have gone so far as to create waterproof duds that are even fashionable… When I was growing up a pair of beach shorts were always bright summer colors and were very obviously made for the water. They were designed with a funny fabric that always rubbed somewhere uncomfortable and I always wanted to tear them off as quickly as possible. These days, especially around Hermosa Beach, beach garb blends in well with everyday outfits and oftentimes blurs the line between beach and street clothes. Stash Bag prototype. This is an individual accessory that they plan to launch after the Stash Shorts. It is similar to the Stash Pocket inside the shorts, but will have slightly different size and materials. A very cool multifunctional pair of beach shorts recently caught my attention on Kickstarter. Salt Lake City man Tom Turner, founder of Stash Incorporated, recently developed a pair of shorts ($79) with a built-in waterproof pocket that can carry everything you don’t want to leave on your beach towel in a safe pants pocket. The shorts are very different from other options sold around the pier and easily mesh style and functionality together in one awesome pair of swim trunks. What often stops me from rompin’ in the ocean (besides the uber cold water) is my worry about things getting stolen. My answer to that problem usually is to leave our valuables in the car or at home, but that idea never flies and one of usually ends up sitting on the beach alone while the other joyfully cools off in the water. Unfortunately, these shorts solve that problem and their ingenious design would be perfect ammunition for my boy to get me into the water. 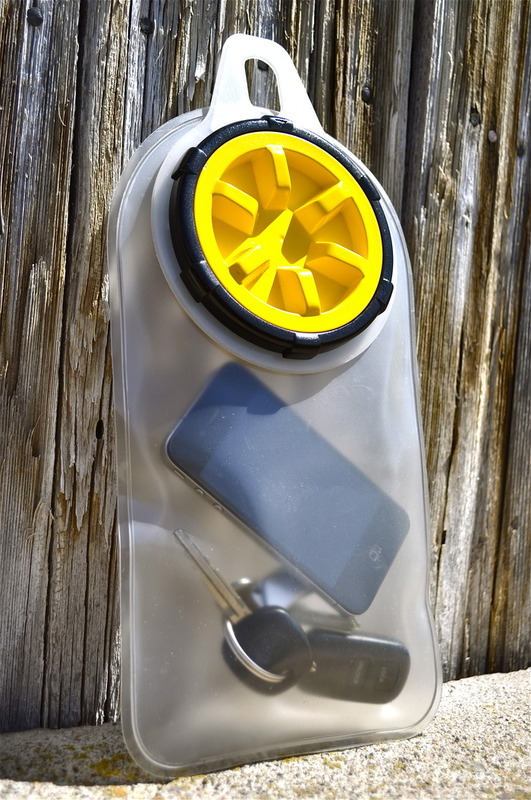 On the plus side, they would also be an awesome way to carry my phone and keys when I’m out on a paddleboard. Stash designer Dave Vogt started the idea out with a waterproof fanny pack and eventually decided it would work best to integrate the waterproof scheme into other types of outdoor gear. The company has produced several Stash Bag prototypes in backpacks, waders, jackets and the current unisex short design. The company is currently seeking $135,000 to help fund the design. They have raised over $9,000 so far and still have until June 5 to fulfill their goal. Visit their Kickstarter page to learn more about their waterproof waders.